I always tell people “it’s more important what you do eat than what you don’t eat”- meaning if you pay attention to eating enough healthy, nutrient dense foods, it won’t matter much if you occasionally have foods you think of as unhealthy. In the last few months, I’ve had to question that aphorism and how it applies to my own life. Despite taking what feels like really good care of myself, I have still suffered a number of aches, pains and minor illnesses I feel like I somehow don’t deserve. In recent months Scott and I have been existing primarily on the fruits of our Settlervore + Vegetable farm share, which includes farm fresh eggs, goat cheese, beautiful local whole grain bread, as well as pickles, frozen berries, and myriad seasonal vegetables. Everything has been delicious, local, and nutritious, but I’ve still not been feeling my best. A few weeks ago I had my semi-annual wellness visit with my doctor, and she recommended blood allergy testing tbecause that could explain a lot of my symptoms, including headaches, stomach aches, nausea, sinus infections, bloating and a bunch of other common aliments. Yesterday I got the testing results, and they were a little startling. I have high-level allergies to gluten and egg white ( I had suspected the gluten, but it seemed like a bandwagon I didn’t want to jump on), moderate allergies to blueberries, carrots and cranberries, and mild allergies to 15 more foods and one commonly used preservative. The recommendation of my doctor was straightforward- an elimination diet that will give my body time to rest and heal itself. Four months without any gluten or egg white, two months without blueberries, carrots or cranberries, and for the rest- I can have one item off the mild list each day, but I shouldn’t have any one of them more than once every four days. At the end of each of the periods of elimination, I am to reintroduce one food per day and see if I react (apparently after an elimination diet the reaction will be more pronounced if my body is still fighting the food), and if I don’t, I can slowly rotate the food back in similarly to the foods I am now mildly allergic to. Not joking, this is my wallet list of allergens. I know what you’re thinking- “Wouldn’t you have known already that you were allergic to all these things?” The answer, is obviously I didn’t, but here’s why: There are different kinds of allergic reactions, but all of them involve your body treating an otherwise harmless substance as an invader. My throat may not close up when I eat an egg, but my body does produce antibodies that try to fight it, thus taxing my immune system. The blood testing I had tested for a huge list of foods and food additives to see if my body was producing antibodies in response to those foods. Many people who suspect they may have food allergies undergo an elimination diet to help diagnose their allergies, starting with the most common allergens. In my case this would have worked for the eggs and gluten, but very few of my other allergens are foods a standard elimination diet would suggest eliminating. So, I now have a handy little card in my wallet to remind me of the foods I am avoiding or eliminating. I woke up this morning feeling a little glum about my new limitations; I had a whole loaf of local spelt bread that i just wanted to make a piece of toast with, but no dice, even friendly spelt has gluten. I finally cheered up when I remembered a new vegan cafe (no eggs!) had opened near me, and had a lot of gluten free options. I went out for a beautiful walk in the sun and had a delicious vegan, gluten free maple doughnut as I looked out at the river. Soon after Scott joined me there for lunch, and I ooo’d and ahhhh’d over my bbq jackfruit sandwich on gluten free bread while he munched away on an ELT, all the while having a hard time believing that the E stands for Eggplant. I found at Pingala Cafe a new angle to my love of food: I may have a shorter list of what I can eat, but now when I eat something delicious, there’s a little voice in my head saying “hooray! I can eat this!” and the food tastes all the better for it. 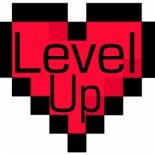 I will update in about a month to let you all know what changes if any I’ve noticed in my health. Have you ever had food allergy testing or tried an elimination diet? I’d love to hear about it. 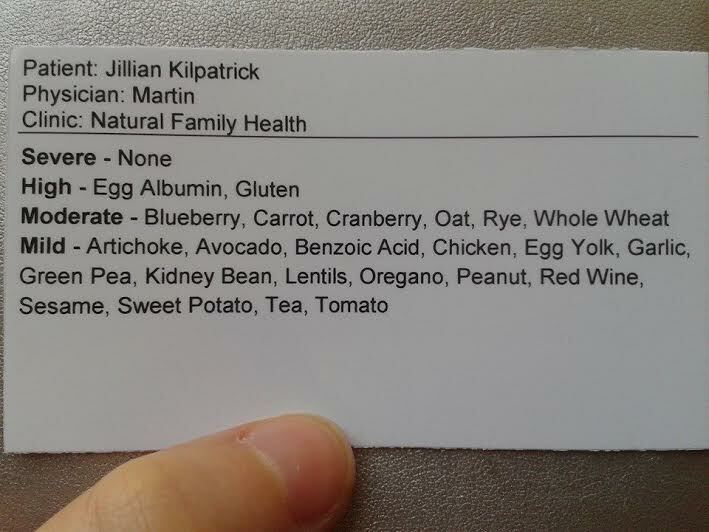 This entry was posted on April 11, 2014 by Chef Jill in Nutrition and tagged allergy testing, blueberry allergy, carrot allergy, egg free, elimination diet, food allergy, food intolerance, Gluten free.